Do blondes have more fun on PokeTalk? In January 2009, I wrote an article for Israel21c about PokeTalk, a then new startup offering free VoIP calls using regular phone lines. I bumped into the company’s founders Shai Genish and Boaz Bahar Wednesday night at a meeting of the TechAviv Founder’s Forum and I thought I’d share the original article with you here on the Blum Interactive Media along with some company updates. The 2009 article was topical, coming in the midst of Israel’s Operation Cast Lead operation in Gaza. Since then, the company has expanded its offerings to include paid calls that can last longer than the free service’s maximum 10 minutes duration, along with many other cool features such as web callback and analytics. But I also heard some disturbing news: PokeTalk has been hit by a significant amount of fraud where unscrupulous hackers have redirected calls, resulting in tens of thousands of dollars in charges for PokeTalk. The situation has gotten so bad that the company is now investing in building its own security software which will also be available to other VoIP services and not just PokeTalk. Shai and Boaz are both very sincere and enthusiastic Israel entrepreneurs who I like a lot. So, here’s the original article without changes. Residents of the southern part of Israel in range of missiles from Gaza can now make phone calls up to 30 minutes to their friends and relatives entirely for free, thanks to a new Israeli startup called PokeTalk. The service, which is already operational in 60 countries around the world, is good for any calls between two phone numbers in Israel’s 08 area code. PokeTalk has been flying high since its launch three months ago. The company, founded by two 25-year-olds in Tel Aviv – Shai Genish and Boaz Bahar – has signed up 70,000 users nearly entirely on word of mouth and viral marketing alone. The service, like fellow Israeli-founded company Jajah, uses voice-over-IP to connect regular phones, not just two computers. As with any good idea, though, there’s a catch: calls are limited to 10 minutes. The promotion on Israel’s front lines triples that amount. PokeTalk is essentially an automated version of the call back systems that were once popular in Israel as a way of saving money. But rather than calling a certain phone number, with PokeTalk you enter your number and the number you want to call on the PokeTalk site. A few seconds later, your phone rings. You pick up and PokeTalk places the call. I took a test drive and the quality is quite good – certainly on a par with other voice-over-IP systems like Vonage, Gizmo5 or even Skype. So how can PokeTalk offer even 10 minutes of talk time for free? On-site advertising. Since you’re required to initiate your call from the web, PokeTalk can show you advertisements on screen. That’s a whole lot less annoying than some other free phone systems that put 10-second audio ads before a call is connected. After only three months in operation, PokeTalk is far from profitable – only 50 percent of calls are covered by ad revenue – but the small eight-person company has raised $1.25 million from Maayan Ventures and private investors. Genish says he hopes to be in the black by the end of 2009. PokeTalk calls can originate from 13 countries – including Israel, the US, Canada and Germany, though notably not the UK – and can be connected to 60 nations, from Kazakhstan to New Zealand. Mobile phones are supported in nine countries. Of PokeTalk’s 70,000 users, 40,000 are in Israel. A viral “refer a friend” program has been successful at recruiting new users too (if your friend signs up, you receive an extra 10 minutes on your next call). On an average day, up to 7,000 users login and make close to 18,000 calls. The company has been featured on Israel’s Channel 10 news and in The Marker and Globes business supplements. Genish estimates that a series of interviews that appeared in the “VoIP Guides” online publication led to some 10,000 new users. The company’s current promotion in the south of Israel probably won’t generate a significant number of new customers, but it’s a noble gesture that helps local residents in tough times. I’ve apparently started running a sweatshop. I didn’t mean to. It’s just what the market seems willing to bear. It began with a small task. I wanted to move the content on my personal blog from one platform to another. Over the last 7 years, I’ve written well over 400 articles for This Normal Life. I estimated that it would take between 3-5 minutes per post to transfer. That involved copying and pasting, adding categories and tags, and downloading and then re-uploading any images. I was able to cut some of that time off by exporting from the original site into an XML format, but the process was flaky and many posts were just dropped indiscriminately. I didn’t relish the idea of spending hours at a mind-numbing task. So I set out to find a “virtual assistant” who could do the job for me. I initially thought about posting an ad on eLance or oDesk but I really preferred to give it to someone local. I was thinking that it would be a perfect job for a high school student, so I priced it at NIS 20 (about $5.00) an hour. The candidate who won the job was not a teenager, though. She was a mature adult whose hours working in the office of a major Jewish Federation had just been cut. I felt terrible about employing someone so competent for such a paltry sum. But she’d accepted the offer willingly. A week later, I put out another ad, this time for voice talent to record a number of dialogues for a language learning project I was hired to produce. I offered 50% more that my first go – NIS 30 ($8)/hour for about 3 hours of work. I was inundated by calls and emails – close to 50 within two days – including semi-professional actors, singers and performers with TV and radio experience. No one was balking at the low pay even though a proper rate for this kind of work would be 3-4 times higher. The whole issue has given me pause for concern. Is the economy so bad that people are willing to settle for so little? And is it right for me to offer such rates? And yet, if I outsourced the work to India or Malaysia, I would be a fool to pay Western salaries. And indeed, I recently had a logo designed via the Internet for the ridiculously low price of $30. A highly qualified local designer quoted me $700 for full branding. 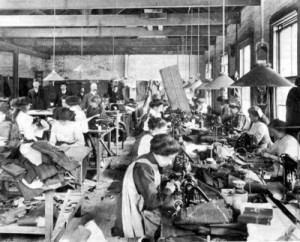 The sweatshops where many of our grandparents worked on the Lower East Side of New York could get away with near slave labor prices, but that wasn’t good for the workers, nor would I say for the souls of their employers. A socially just policy should have the boss paying a fair rate, regardless of what the market can bear. I’ll probably send my artwork requirements overseas again. But when it comes to my virtual assistant, I’m doubling her pay next time. There’s more to business than bragging over a bargain. A shorter version of this article originally appeared on the Israelity blog.